The Train à Grande Vitesse speeds through the countryside: fields of green and brown, hills rising in the distance, rows of grapes, houses and farms dotting the spaces in between. Chapter 7, page 183. “Ou etes-vous allé(e)?” (Where did you go?) The perfect way to frame a chapter introducing the use of “le passée composé avec être”, allowing me to finally relate past events correctly with the verb “être” (to be). 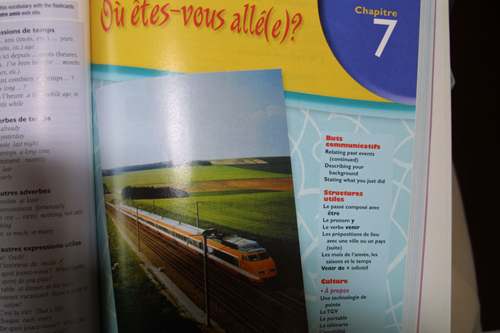 Because it’s a well-known fact that when beginning learners of French try to talk about the past, they frequently mix up the verbs that take “avoir” (to have) and those that take “être”—very often verbs of coming and going, of motion. And what better way to learn how to recount moving through the past than to do it on the TGV, through the beautiful French countryside? Vocabulary never seemed so real. I sit in Car 12, Seat 96 (voiture 12, place 96) of iDTGV No. 7912, departed Lyon Perrache station at 14:46 with a brief stop at Lyon Part-Dieu station, scheduled to arrive at Paris Gare de Lyon at 16:59. 4 seats face each other on the second floor. A woman, another student I guess, sits diagonally across from me and tries to close her eyes and rest, a brief respite from the stack of books on the table in front of her. A couple talk in the seats on the other side of the aisle, animated discussion interrupted only by cell phone calls coming and going. 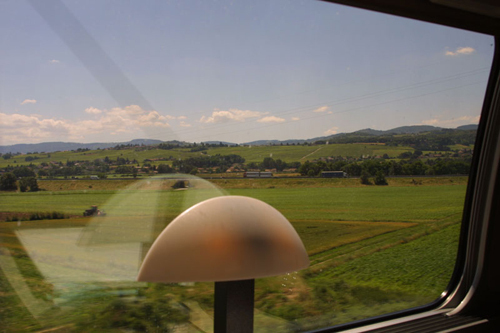 The TGV—my TGV—speeds through the French countryside: fields of green and brown, hills rising in the distance, rows of grapes, houses and farms dotting the spaces in between. What kind of conversations will I have when I arrive in Paris? The train rocks gently back and forth. “I have arrived” is incorrect, I am reminded. I should rather say, “I am arrived”. Isn’t this what studying French is all about? What more ‘textbook’ experience could there be? Perhaps a cup of coffee at an open-air cafe when I arrive, maybe a little trip to the Louvre tomorrow after a stroll along the Seine? This is not French study, I think, but rather French study*. Or maybe it’d be better to write French study™. As I sit with my book open, 90 km south of Paris and closing, I struggle to reclaim my experience from immediate conversion into idealized, sugar-coated, and eminently marketable icons of language learning experience, as written right into the cover of my textbook—and, for that matter, into the brochures of a thousand study abroad programs promising to lead students up the mystical slopes of Mount Fuji in Japanese, to admire the grandeur of the Statue of Liberty in English and, yes, to take them up the Eiffel Tower in French. Everything is perfect in this illustrated geography of language learning. Trees dot the distance outside my window. The sun has moved across the sky just a bit, or maybe the train has inscribed a slight arc on its ascent to the capital. It’s hard to tell, cruising smoothly at more than 200km/h. The sun shines through the window and glints off the base of the window frame. Fields rush by. Are those really grapes? I look around the cabin. And then I notice something interesting. Nobody seems to be looking. Surely a coincidence? Qu’est-ce que vous regardez? (What are you looking at?) When the scenery is so nice, what else is there to regard? The woman across from me has shifted but still has her eyes closed. People who sit further away are reading, sitting in contemplation, talking in hushed tones. Then the highlight for me, a moment that tells me what to do with my overly serious reflections. The woman on the other side of the aisle, who had been on the phone, is again talking excitedly with the man across from her. And in the middle of all this, perhaps to illustrate a point, he reaches down, grabs one of his feet and pulls it up towards his nose. He smells it. No, seriously, he takes a good, long sniff. Might even say a drag. Says something and the woman laughs. Then, as if that wasn’t enough, he extends his foot straight across the space between the two of them, up towards her face. She leans over and smells it too. Je suis venue. We’re still 80 km away from the promised streets of Paris and the myriad ‘authentic’ conversations that are supposed to make the French in my textbook come alive. But, I think, I am arrived. I look at the woman across from me. She sits now, eyes open, her slight smile telling me she might have seen what I saw, or seen that I saw it. I put down the book, and we begin to talk.